Sometimes, when pain is just not responsive to standard methods described here, a Medrol Dose Pack will help. You need a prescription for this! Personally, I have used it on 5 occasions so far. While I do not like to take a steroid medication, it has been effective for severe levels of pain and inflammation from a herniated disc in the neck or a herniated disc in the back that is causing nerve pain. I get many questions for neck pain products from individuals with neck pain. Some of these will call and ask about special ergonomic pillows or traction devices for a recent disc herniation. When they say they are not sleeping because of the pain and the pain is very severe, I give suggestions regarding these products and a stretch to help neck pain, however; with high levels of pain, and you can hear it in their voice, I try to tell them that these products are secondary to getting something that will help the pain now and have a significant impact on faster recovery. Most know I am a Chiropractor and want natural remedies for neck pain, however, there are times when something more drastic is necessary. When the pain is severe, especially with radiating pain down the arm or, in the case of the back, radiating pain down the leg, and over the counter medications do not provide any relief at all, I suggest they talk to their doctor about a steroid. The most popular method today is injections. These are very specific and relatively safe when done as a guided procedure. Some have contraindications to injections or may choose not to have the procedure done. There is another way of obtaining this anti-inflammatory benefit. I try to explain that there are such high levels of inflammation, that standard methods such as ice and over the counter medicines like Ibuprofen will not provide much relief. The main thing is to get rid of the inflammation as fast as possible. Once the inflammation is gone and the pain has subsided to a degree that you can get some rest and be relatively comfortable, we can talk about pillows, traction and other natural methods to help get you better faster and to help avoid problems in the future. My initial concern is, during the first week or two, to relieve what can be a great deal of suffering. I can say this from both clinical and personal experience. Clinically, most cases do not involve these severe levels of pain. However, when a patient comes in with a recent and severe herniated disc, usually the doctor has given them some typical pain medications and they come in with a very distressed look on their face. I would typically proceed with pain relief and anti-inflammatory therapies such as ice, electrical stimulation, ultrasound and some minor postural adjustments. While this provides some temporary relief, very temporary, they come back the next day with the same look, only more exhausted from the pain and not sleeping well, regardless of which pillow I gave them. This is a very frustrating situation as a provider. At this point, there really is no choice in my mind. You can continue with the therapy and you should, but I want to talk to your primary physician or orthopedist about a Medrol Dose Pack. It is beyond my scope to go into the details. It is a steroid, a corticosteroid that is taken for a short period (1-2 weeks), starting with larger quantities and reducing the amount each day until finished. It has been my experience that relief can start with a couple days. Regarding the details. 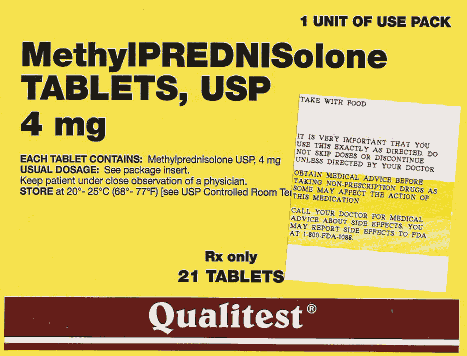 It is an oral steroid, Methylprednisolone, and has many side effects and contraindications. I am not going to list all of them, you can find these elsewhere. Bottom line, you must talk to your doctor. Your doctor is aware of your health history and will know any complications or contraindications, such as medicines you are currently taking or other health conditions you may have. Fortunately, for most, side effects consists of an increase in appetite, but only for a short period. It was always a pleasure working closely with their medical doctors and I was always glad to talk to them and sometimes be able to tell the patient, your doctor has prescribed a Medrol Dose pack, go to the pharmacy, talk to the Pharmacist, read the instructions and you have a follow up visit with your doctor on this date. It was rare that this could not be prescribed. Obviously, things like pregnancy and other health issues from the history would serve to screen the patient prior to my contact with their doctor. But, when it was successful, it was amazing to see the difference when they came in a couple days later with a smile on their face. Now we can get to work! Personally, it is embarrassing somewhat to be a Chiropractor with neck and back problems. But, no matter how much you study, no matter how many textbook examples, clinical studies or how many patients you treat, it is also somewhat comforting when a patient realizes you really know how they feel. The look on the face, the same one I had, more than once. So, on rare occasions, I feel that a Medrol Dose Pack can be a helpful medication to reduce severe pain and inflammation related to an acute herniated disc in the neck or back. I am able to communicate my clinical as well as personal experience and this seems to reassure someone who is concerned about using a steroid medication. Remember, there are many contraindications and side effects with this medication. Check with your doctor and talk with your pharmacist. Corticosteroids are used for many different conditions and this discussion is only in relation to acute/recent herniated discs with severe and radiating pain that do not respond to typical medications and therapies.